I’ll speak for myself. It’s only the middle of December and I’m a bit tired of this holiday season already. It probably has something to do with the days being so short. The noon sun is so low in the southern sky that a habitual twilight-squint has settled in between my eye brows. It’s hard to find rhythm in all the hurry and fuss. Taking a nap on your nose might pass as an elite act of rebellion! As Christmas music blasts in every public place, it would be generous for the majority group to remember that not everyone celebrates this holiday. Not everyone has family. Not everyone can keep up. If the holiday was a trail ride, it would be good manners to slow up so it was comfortable for those with less wherewithal, rather than galloping off and abandoning them in our wake. Even if you love the holiday, it can be an exhausting, stressful time of the year out in the real world. Not that stress is necessarily bad. Some of the stress is fun; annual parties, people speaking the universal language of cookies, Christmas lights strung everywhere, and family dinners. Some of the stress is not so fun; budget breaking expenses, time pressures so huge that you can already be late before dawn, the need to be endlessly cheerful, and…family dinners. Humans like routines as much as horses, but during this month our usual routines are especially uprooted. We are torn between barn time and holiday obligations. The pressure of the outside world puts speed requirement on every moment and life can feel like a total runaway, only the wrong direction–away from the barn. At the same time, it’s our daily routines and rituals are truly what keep us polite and reasonably sane. As we have less time and more demands- our healthy routines are usually the first to go, taking along our patience and humor. Horses display stress in a million ways, including stiff necks, upset digestion, wild eyes and flattened ears. Eating and drinking habits can change. Horses under stress can be moody, cranky and irritable. Do you notice any of these symptoms when you look in the mirror? Dressage has an exercise called a half-halt. Its purpose is to improve the horse’s balance and attention. In the best application, it is a near Zen-like experience of beginning fresh. Maybe a human half-halt would help right now–just a pause to catch your balance. You don’t have to gallop along with the herd. You can ride your own path. If you are really busy, you could choose to just skip the barn visit. Christmas isn’t really their kind of holiday. Horses will wear that stupid Santa hat to please you, but their heart isn’t in it. And if your mind is on everything you haven’t gotten done, you aren’t such great company anyway. If you do go to the barn, give your ambition a break. This isn’t the time to work on cleaning up that canter depart or beginning half pass work. It’s the season to expect less–some days it’s an achievement to stand in his stall. 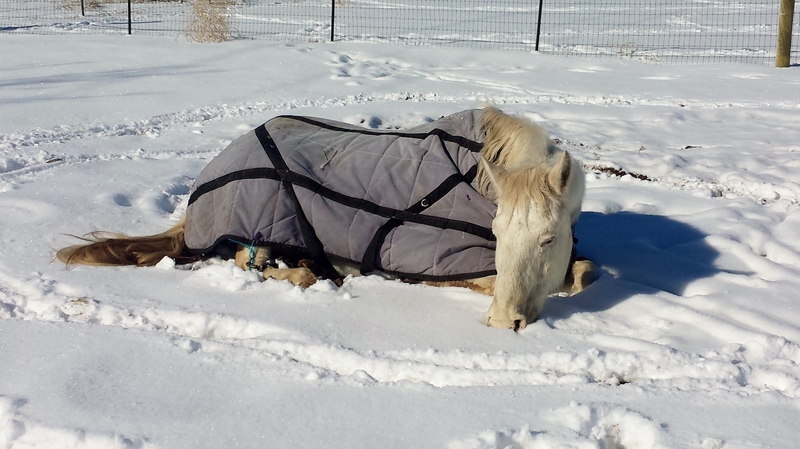 There is that warm place under his mane and just resting a hand there is a healing. If you are working on listening–and you should be–then let his aid to you be peace. Take the cue. Breathe. Let be. It’s enough. In the arena, walking can be plenty. Set the clock to horse time. Let the ride be a slow dance. Let your horse’s hips sway you. Resistance melts and warms you from the bottom up. Saunter around until your brain gets soft. Then take a few minutes and remember. Sometimes in the effort to improve and move ahead, we forget to look at the big picture. You have a pony. The rest is decoration. However you feel about the holidays, they are here. Lit up with all the usual blessings and challenges. And like every other day, you are a rider. You can half-halt, and then take the season at your own pace. Anna, you are absolutely right! We so often forget to stop and appreciate the beauty around us. I go visit my horse not because I have too, but because I want to. It makes for nicer visit for the both of us. It’s a privilege, for sure. Thanks. Grandfather horse has the right idea he’s definitely chillin’. Ah yes the holiday madness, peace and goodwill to all mankind and animal kind. Thanks for the tips on horse stress and crankiness, we got some cranky horses and I am cranky every other. Try not to be. I gave a lovely horse massage the other day he really did seem to enjoy it, some relief to back ache and itch. first one of many I hope and it was over the stable door (getting to know you) but I reached in good and worked that huge back end used some oil for the itch on the tail. Half halt reading your blog to the end for a change! Great post! I love the holidays, but I hate how stressful they have become; it’s like we miss the real purpose because we are too busy rushing around. I agree, on this holiday most of all. Thanks for commenting. All true! The best thing IS that warm spot under the mane. That & just standing by your horse & listening to him chew!!! (best sound there is). I was “just” a trail rider (have dressage friends) but that time at the barn – the best in the world! Celebration should be an opportunity, not an obligation. Glad that works for you… it is about having a choice. Wishing you a great season. Less is more, with horses and this holiday. I need a human half-halt. Right you are, there is a deeper grooming than a mane comb can do. Thanks. Lovely post and just what I needed this morning–thanks!